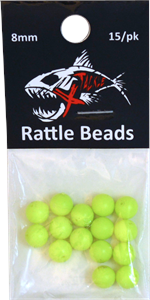 The XTackle Rattle Beads come in two sizes, 6mm & 8mm. The compact 6mm was designed for maximum rattle in a small package. and gives off a bigger sound that attracts more fish from a greater distance.